Our Optical Boutique offers a vast array of designer frames to suit your needs. We have a current selection of Dolce & Gabbana, Nine West, Ray Ban, Ted Baker, and Vogue, to name a few. 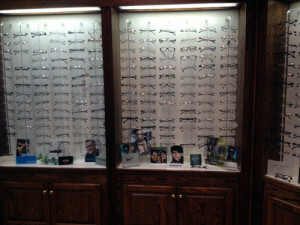 Our Optical Boutique also offers additional lines for guests who prefer a more traditional look. We strive to provide an optimal selection for everyone! We are pleased to offer a full stock of contact lenses which include Acuvue, Focus, Freshlook, Purevision, Soflens and more. We also have toric contact lenses for patients with astigmatism in addition to bifocal contact lenses.